Are you looking for the adventure of Spiderman, the challenge of Minority Report and the thrills of The Bourne Identity? Then you've come to the right place! Netflix could be your biggest and best career challenge yet. Started by some of the hottest players from Silicon Valley to Hollywood, Netflix is the world's first and largest DVD online rental store. We are, quite frankly, the future of home entertainment. * Ability to lift 25-50 lbs. eWeek.com has an update on the battle to determine a winner is the next-generation DVD format wars: Microsoft, Intel Back HD DVD. Many PC makers are squaring off on the other side, however, with Blu-Ray backers including Apple Computer Inc., Hewlett-Packard Co. and Dell Inc.
Movie studios are likely to play an even more important role in swaying consumers, but they are also split: Sony, News Corp.'s Fox and Walt Disney Co. back Blu-Ray, with Viacom Inc.'s Paramount Pictures, General Electric Co.'s NBC Universal and Time Warner Inc.'s Warner Home Video backing HD DVD. Lions Gate Entertainment Corp. and Vivendi Universal SA's Universal Music Group joined the 140-member Blu-Ray Disc Association in August. If they can't settle on one standard this will be a mess for consumers, and slow sales of the new players while consumers wait to see who wins. And you know how I feel about the new DVD copy protection schemes. While I don't approve of piracy, haven't they learned from the music industry? The majority of people are willing to pay for content, as long as it is priced reasonably and usable, like Apple's Fairplay technology in iTunes (you can play your music on up to 5 computers and even burn CD's). The more protection you add means fewer players can play it, and the more problems paying customers are going to have (one scheme will disable your DVD player if you play a questionable movie). I read this a long time ago and I'm sure it's true of the latest copy protection schemes: anything that can be encrypted can be decrypted (I bet the hackers will break it in a few weeks). Focus on making the DVD experience so amazing and reasonably priced that I want to give you my money and you'll win. Spend your money on the product, not making it harder to use. One more thing: Stop making your paying customers feel like thieves. I don't want to watch a loud and annoying anti-piracy video when I play a movie I just bought. Which is your favorite James Dean film? Why does James Dean have such a big place in popular culture? What actor should play James Dean in the next feature film about his life? Netflix announced that the Q3 investor webcast will be held at 3pm (PT) on October 19th. Anyone can listen in at http://ir.netflix.com, and a recording of the call will be available later in the day. This should be interesting since Netflix will provide an update to Q4 guidance and an outlook for 2006. -- Ending subscribers of 3.590 million to 3.610 million, from 3.35 million to 3.50 million. -- Revenue of $173.5 million to $175.5 million, from $172.5 million to $176.5 million. Netflix also said that its third-quarter results will reflect anticipated settlement expenses associated with the previously disclosed consumer class action, Frank Chavez v. Netflix, et al. Settlement expenses in the quarter are expected to range from $3.0 million to $4.0 million. The settlement remains subject to court approvals. -- Including the non-recurring settlement expenses, GAAP net income guidance has been revised to $2.5 million to $5.3 million, from $4.5 million to $8.0 million. -- Excluding the non-recurring cost of the settlement, net income is expected to be $6.5 million to $8.3 million for the quarter. "Our business continues to perform exceptionally well, with rapid subscriber growth and operating efficiencies enabled by market leadership," said Reed Hastings, company CEO and Co-founder. We are looking for a senior-level engineer who has a background in adaptive systems, artificial intelligence and personalization and who has deep experience building real- time, scalable systems. The successful candidate will be a self-motivated, intellectually curious individual who takes pride in coding highly complex applications. As a core part of our design and implementation team, you will be building the best and most relevant search and personalization software available and will be working with some of the brightest people in the E-commerce arena. Your work will be a critical part of the success of our business, affecting millions of customers by improving their entertainment experience. Netflix Shipping Movies from Baton Rouge? Thought this was amusing, in a sad way. Just as I began to wonder why my last batch of DVD's were taking so long to reach me, they arrived... a full nine business days after the "shipped on" date. Why? They came from Netflix's Baton Rouge, LA hub via what must surely be a drastically overwhelmed postal system in lower Louisiana. Naturally, the return envelopes also require the discs to be returned to Louisiana, but a stick-on label will instead send them to a hub approximately 20 miles from my home. A new way of slowing down rentals even further? Sending them through natural-disaster zones? Anyone else get Netflix or Blockbuster movies from the hurricane region? 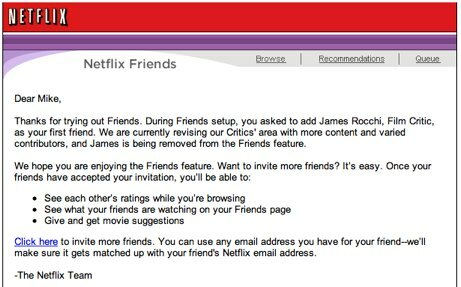 James Rocchi, who used to be the Netflix in-house movie critic, has already built a new blog for life after Netflix at RocchiReport.com. Posting's going to be light for a few days; I'm still filing a few things for Netflix before my last day, but next Friday you'll be able to read some of my reviews for another online site, and there's going to be more inbetween now and then as well. 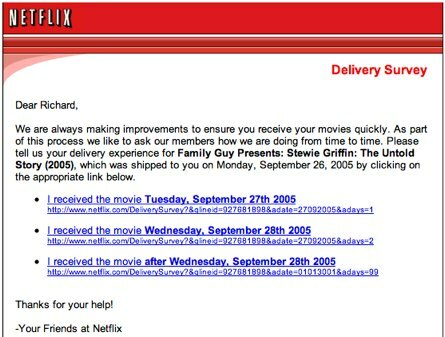 If you've been a Netflix member for a while, you might have noticed that Netflix sends out quick surveys to find out how fast your movies get to you. Netflix uses these srveys to select locations for new shipping centers and to help isolate problems. Has anyone seen one from Blockbuster? Bear Stearns upgraded Netflix to "outperform" from "peer perform" and raised its price target and earnings estimates for the company. "As we launch coverage today on Blockbuster and Movie Gallery, we now are more bearish on in-store rental trends, trends which stand in contrast with those of Netflix," said the firm. "We believe that online rentals will take share at a rate faster than we had previously expected." Thanks to Jeff & Joe for sending this in.